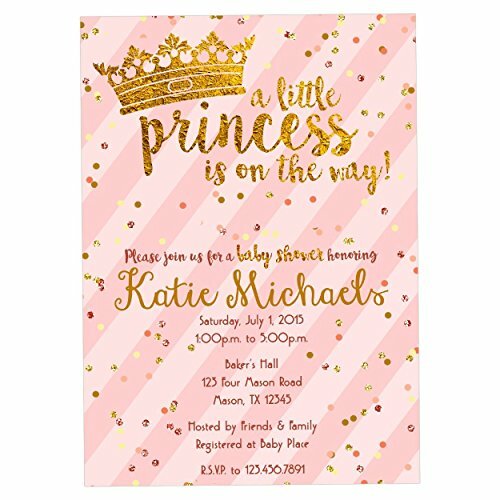 Elegant pink and gold baby shower Invitations for your princess baby shower, featuring the mother's name, party information in stylish pink stripe design, surrounded by confetti design, rhinestone confetti and gold foil accents. (Note: glitter/foil is a printed design, not real glitter). This fancy gold princess baby shower invitation is professionally printed on 100lb gloss cover stock. The base price is for 10 invitations plus blank white envelopes! More quantity can be added in the drop down. Invites are single sided 5x7 and printed on premium 100lb gloss cover stock. Option to add solid matching background printed on the backside, and option to change stock are both available in the drop down options. 3. Complete checkout with your personalization. Make sure your personalization is correct when submitting to insure the item will be designed correctly. 4. Your item will be designed & made and ships 2-3 business days from order date. All orders are shipped via USPS Priority Mail - USPS advertises 2-3 day transit with tracking, however, transit time is not guaranteed via USPS. If you need a guaranteed method, I do offer an upgrade to Fed-ex 3-day Guaranteed in the drop down. Due to the difference in monitor calibrations, colors on the screen may vary slightly from actual product printed. If you have any questions about this product by Party Print Express, contact us by completing and submitting the form below. If you are looking for a specif part number, please include it with your message.